Nikon’s S1100pj camera is one of those gadgets that is absolutely guaranteed to impress any onlookers. It’s a normal point-and-shoot camera in every way–except that it has a full-scale, surprisingly good projector crammed inside it. Nikon’s S1100pj point-and-shoot camera is fairly ordinary in most ways. It’s a 14.1 megapixel shooter with a 5x optical zoom lens and a 3-inch touchscreen that offers image stabilization and 720p video recording. It even has a traditionally anti-catchy name made up of a grab-bag of letters and numbers. But in fact, this is one of the ballsiest and oddest consumer electronics gadget to be released this year. The S1100pj is the followup to the S1000pj, predictably enough. The S1000pj was the first affordable projector camera to be aimed at the consumer market, and while reviews were mixed, it was undoubtedly a fascinating little gadget. Due to its high price and questionable utility, the original S1000pj wasn’t exactly a “must buy” device, but the S1100pj improves on it in every way–don’t be surprised if you find yourself lusting after it a little bit. The projector isn’t a dinky little dim bulb, but a real, honest-to-goodness 14-lumen projector that shoots an image of up to 47 inches from seven feet away. Nikon claims the new projector is 40% brighter than the one in the S1000pj, which may help eliminate its predecessor’s difficulties in daylight. The logical use for a projector camera is to display photos you’ve taken, which is exactly what last year’s model was designed for. But really, if you’ve got a pocket-sized projector, why limit it to only the photos the camera has taken? The S1100pj’s killer feature is its ability to plug into a computer via USB and project whatever’s on the screen. That might just turn the S1100pj from a camera with a projector into a projector that takes photos. All this would be for nothing if the price wasn’t right. The S1000pj retailed for $430 last year–pretty cheap for a projector, but damn expensive for a point-and-shoot camera. The S1100pj, in comparison, costs only $350, which is completely reasonable and even affordable. A camera of that quality could well cost $300 by itself, and to add a surprisingly good pico projector into the mix and still land at $350 is commendable. Pico projectors like this one are likely to be crammed into all sorts of places in the next few years–laptops, smartphones, tablets, camcorders, and more–and the S1100pj is one of the first iterations of the technology that’s genuinely useful. It’s innovative and groundbreaking, but it’s also really, really cool. 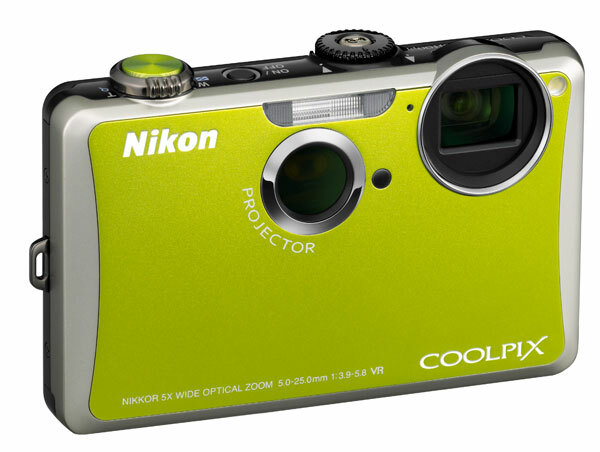 The Nikon S1100pj will be available in mid-September for $349.